Art Farmer, Louis Mucci, Jimmy Knepper, Jimmy Buffington, John las Porta, Hal McKusick, Manuel Zegler, Robert di Domenica, Teddy Charles, Margaret Ross, Barry Galbraith, Joe Benjamin, Teddy Summer. 30 May, 1957, New York City. The groundbreaking Gunther Schuller/George Russell Orchestra, playing All About Rosie which was taped by NBC TV and broadcasted as part of Tonight Show. I don't know if this historical moment in jazz has survived in any visual format. Art Farmer (t), Jimmy Cleveland (tb), Gene Quill (asax), Barry Galbraith (g), Eddie Safranski (b), Ed Thigpen (d), George Russell (arranger). 18th (?) June 1958, New York City. This is the 13th and the last installment of a program called The Subject is Jazz which was aired on NBC, USA, in 1958. Cleverly, and mostly thanks to show's musical director Dr. Billy Taylor, this last episode is called The Future of Jazz which truly explains the new directions in the history of jazz. The Subject is Jazz is hosted by Gilbert Seldes who doesn't seem like a very patient man or one who enjoys Russell's innovations. The series was consulted by Leonard Feather and Marshall Stearns, and this one was directed by Lynwood King. The complete show can be seen here which includes Billy Taylor on piano, playing Early Bird and Double Exposure, plus an excellent interview with George Russell. I must add to the existing info that in 1958 Bill appeared on NBC for a second time, toward the end of the year (7th of December), as a member of Tony Scott Quintet and played I'll Remember April. I have no record of that take on the internet. Chuck Israels (b), Paul Motian (d). Spring of 1962, The Village Vanguard club, New York City. From the TV show, known as Camera Three, directed by Nick Havinga. 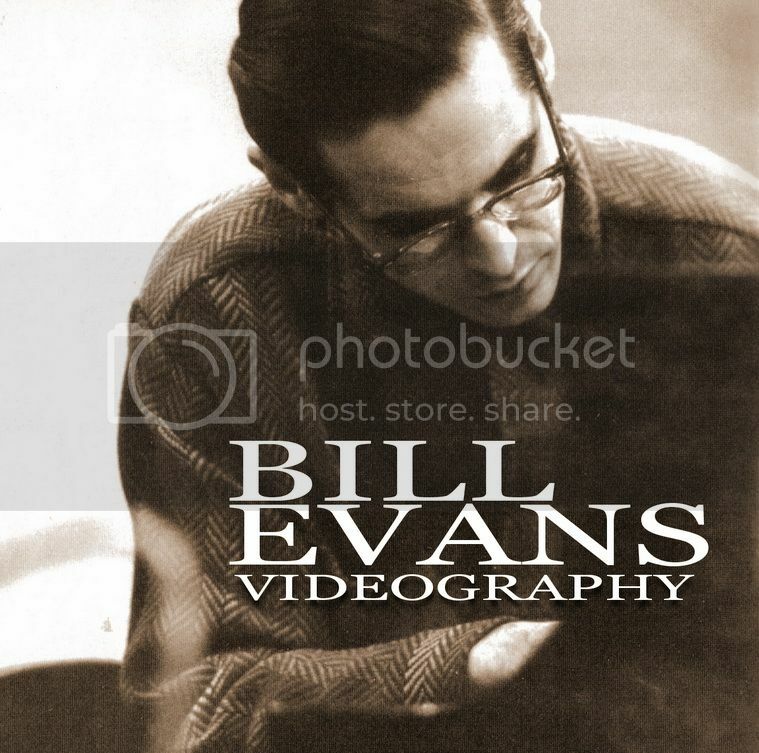 The video quality is awful, faded and with zero contrast, but the sound is good enough to enjoy the set, especially if one considers the importance of Village Vanguard in Bill Evans's life and career. Chuck Israels (b), Larry Bunker (d). From Steve Allen Show, and not available online. Chuck Israel (b), Larry Bunker (d). 2nd September, 1964, Stockholm, Sweden. Chuck Israels (b), Larry Bunker (d), Monica Zetterlund (vocal). The Youtube uploader says: "This is from a Swedish produced programme sent on Norwegian television called Monicas allra bästa. Originally broadcast in 1965 on a show called En stunds jazz, it was thought to have been lost forever, but some genius thankfully found it in SVT's archives." The clips presented here are extracts from Reflections of Bill (1985), a documentary in which Monica Zetterlund recalls her gigs with Bill Evans Trio. 19th March 1965, BBC, London, UK. Legendary Jazz 625 show, hosted by great Humphrey Lyttelton; Director and producer by Terry Henebery. Lee Konitz (asax), Niels-Henning Orsted Pedersen (b), Alan Dawson (d). From Jazz pour tous! show. Niels-Henning Orsted Pedersen (b), Alan Dawson (d). October 30, 1965, Berlin Philharmonie, Berlin, West Germany. From a legendary piano summit with Jaki Byard, Earl Hines, John Lewis, Lennie Tristano, Teddy Wilson. The complete TV broadcast is here. 1st November 1965, Stockholm, Sweden. Early autumn, 1966, New York City. The Universal Mind of Bill Evans is a TV documentary, directed by Louis Cavrell, and narrated by Steve Allen which is actually an extended version of the film Bill Evans, jazz pianist, on the creative process and self-teaching. Here, Bill is interviewed by his older brother and the music educator, Harry was very important to his younger brother's life and later by committing suicide left Bill in anguish and pain. Songs played and heard in the film include: Love theme from Spartacus, How about you?, Star eyes, Very early, Time remembered, My bells. Sometimes Youtube videos do not play on Blogger, because of copyright infractions, but of you go directly to Youtube page, you'll be able to watch it there. I think this video is one of those, so here you go. Eddie Gomez (b), Alex Riel (d). October 28, 1966, Munch Museum, Oslo, Norway. From a TV series called Tema med Variasjoner, directed by J. Bergh. There is a short documentary video about two famous Oslo concerts here. Eddie Gomez (b), Alex Riel (d), Monica Zetterlund (vocal). Done as a charity show for Danish Red Cross. For a broadcast from November 1966, on Danish TV, visit this webpage. At Lugano festival in Switzerland. Apparently filmed and broadcast by Swiss TV. The song Yesterdays included. Jeremy Steig (flute), Eddie Gomez b), Marty Morrell (d). From Camera Three (Season 14, Episode 36, directed by Merrill Brockway), the same TV show on which Evans appeared back in 1962. My quick search tells me that this one was mainly Jeremy Steig's showcase rather than Bill's. I haven't seen it myself, and sadly, have no trace of it in any format. 27th February 1968, The Village Vanguard club, New York City. Directed by Leland Wyler and put into a 17 minutes portrait titled Bill Evans. Part of NBC TV broadcast in series Camera Three (Season 14 Episode 29). The NBC broadcast also includes Jade Visions from Village Vanguard, June 1961. Again, I feel like a useless bloke for not having any address of this lost 1968 TV broadcast. To close the 1968 chapter, we must point to the Dial M for Music TV series, aired in the spring of that year. What connects this TV show to Bill is his appearance, along with Teddy Wilson, in one of the episodes, playing Who Can I Turn To?, Eddie Gomez and Jack de Johnette accompanying him. Later, The Bill Evans Trio (line up as above) returns to the program with John Lewis and the orchestra for a concert taped on 13 July, 1968. Eddie Gomez (b), Marty Morell (d). July 8th, 1969, New York City. US TV-broadcast from The Steve Allen Show. Also discographies mention some broadcasts in Sweden, from Club Arthur Gothenburg (November 16th 1969) with Gomez and Morell. I haven't found anything yet. Zetterlund, vo; Evans, p; Chuck Israels, b; Larry Bunker, dm. Evans, p & vo; Israels, b; Bunker, dm. Many thanks for pointing out that which is now amended. where is director "Leland Wyler"